October | 2015 | NFL News, as it happens, when it happens. Your one stop shop. It’s almost November, which means it’s time for the real teams to show who they are. This is a post-Thanksgiving league, but teams with good records and flaws will start showing them about now. 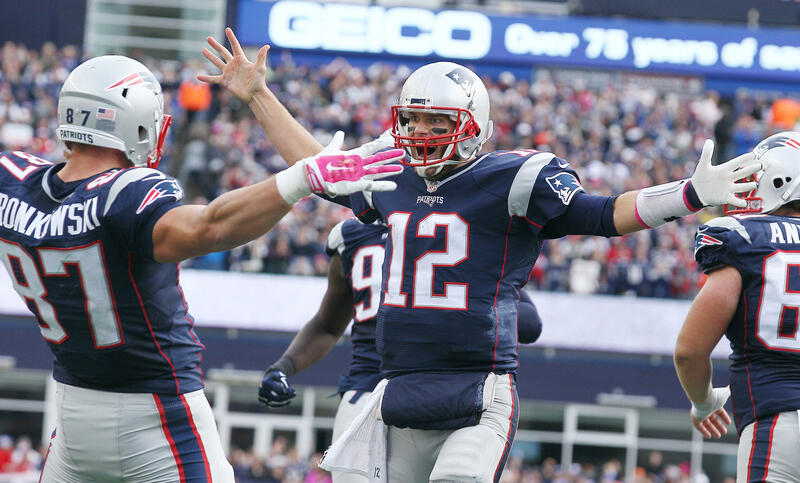 One team that is minimally flawed is the New England Patriots. Last night, they showed why it’s so hard to beat them. Obviously, everything revolves around Tom Brady on offense. The guy is unbelievable, and at age 38, he’s somehow playing better than he ever has. He recently said he wanted to play ten more years. At this point, it’s kind of hard to say he’s crazy for saying that, isn’t it? I’ll believe Brady can keep playing at this level forever until I see him deteriorate, and he hasn’t yet. Gronk caught his 61st career touchdown pass last night. that is one fewer than Shannon Sharpe, who played eight and a half more seasons. Once Gronk passes Sharpe, which he will do shortly, he will have more touchdowns receptions than any other tight end in the Hall of Fame. He’s changing the game. Despite injuries upon injuries upon injuries, Belichick keeps finding a way to make this offensive line work. Just when it looks like they have an injury that they can’t sustain, they fix it without you even noticing. Blount and Dion Lewis are perfect complements in the backfield. Lewis is so valuable both as a receiver and as a runner. He’s so quick that he can create space where there’s none. But at the end of games, when they need to run out the clock with a power running game, Blount is there to drop the hammer. You might point to the Patriots defense and say it’s not as good as last year because of the personnel. I would tell you to watch them actually play. The secondary has yet to be an issue, and they’ve played against Big Ben and Andrew Luck, and most recently shut down Ryan Tannehill who was on fire. Their pass rush abused the Dolphins offensive line last night, and Jamie Collins is the best player in the NFL that no one knows about. He’s one of the best overall athletes and the league, and he’s excellent at playing in space. The overlooked part of the Patriot’s team that is a complete testament to Belichick’s coaching is their special teams. It’s not just the fact that Stephen Gostkowski is arguably the best kicker in the league. Edelman and Amendola steal a lot of yards on punt returns. They’re shifty and know how to create space the way Lewis does. And their punt coverage is superb. I’m looking very intently, and I cannot find a glaring flaw in this team. They are heavy Super Bowl favorites until they prove they shouldn’t be. On to this week’s picks. Andy Reid and Jim Caldwell get sent to London. I think this is a great punishment for coaches that don’t know how to manage the clock. I think instead of a game clock they should take Big Ben and put it in the middle of the field, and tell both coaches to figure it out. Also, I’d be in favor of giving Reid an extra four timeouts per half just to see how he wastes them. But in all seriousness, these are two bottom ten teams in the league, and I’ll take the points. I think the Falcons offense will wake up against a Buccaneers defense that let Kirk Cousins go 80 yards in less than 2 minutes to win the game last week. Seriously, an offense that features Julio Jones, Matt Ryan, Devonta Freeman, Roddy White and that improved offensive line should score more than ten points this week. Then again, that offense only scored ten points against the Titans, who are an atrocious team outside of their quarterback. Let’s backtrack a little bit on the Cardinals offense of Carson Palmer, Chris Johnson, and Larry Fitzgerald being an elite offense in 2015. But seriously how good would it have been six years ago? This is still a good team, but you saw them struggle to put the Ravens away at home last week, and Cleveland is a tough out. Plus Arizona is much better at home than on the road, and with a long flight I expect the Browns to cover. This is going to be a long day for Colin Kaepernick. The only time he looks good is when he doesn’t have a pass rush, and the Rams have the best defensive line in football. I expect Kaepernick to be on the ground all day and Todd Gurley to run all over the San Francisco defense that has a ton of holes. I’m really glad the Saints won two games no one expected them to win and now they’re getting too much respect. Let’s not sleep on the Giants. They beat the Cowboys by a touchdown, but because that wasn’t a big enough difference everyone’s jumping ship. This is still the best team in the NFC East, I expect them to roll in this one. The Vikings could still be a playoff team. I don’t care that the Bears are at home, they shouldn’t be giving points to anyone. Minnesota’s offense is beginning to emerge as they now are finding who their playmakers are, guys like Stefon Diggs. Just because the Bears were on a bye last week doesn’t mean they’re a different team, this is still a horrible defense and Jay Cutler is an accident waiting to happen. Now that we’ve accepted the Ravens are a bad team, I think they’re a pretty good bad team. They hang around in games, they run the ball pretty well, and don’t act like Flacco can’t make plays. Most importantly, he’s at his best when he needs to be, and that’s when he has the ball in the last two minutes with a chance to tie or win. Also, congratulations to Phillip Rivers on his eighth child, you now have enough kids to get your own reality show. Also congratulations on being the best replacement for Ben Roethlisberger my fantasy team could’ve possibly asked for. You the real MVP. Big Ben is back, and while this is a much more compelling game because of that, don’t go too crazy. The Steelers are 2-4 in the first game after Roethlisberger comes back from an injury, and he’s averaged under 200 yards per game in those games. The Bengals are coming off of a bye and have the most complete roster in the league. While Big Ben makes this a more even matchup, the Bengals still have the edge. It sounds like Mariota is going to play, and if he does I think the Titans are the better team. But, do yourself a favor and don’t go anywhere near these two horrible teams. Don’t watch this game, don’t bet on this game, don’t even think about this game. I already want to throw up, let’s move on. All of a sudden this is a really good game. I’ve been on the Raiders all year, and I will continue to be after seeing how they jumped on San Diego early last week. Had he been a part of last year’s class, Amari Cooper easily could’ve been the top rookie receiver last year (you hear that OBJ?). The Jets played really well against the Patriots last week, but they fell short, and now they have to fly cross country after an emotional let down. I’m grabbing the points and the better quarterback in this one. Maybe Dez plays, maybe he doesn’t, but does it really matter? Matt Cassell may throw down the field occasionally, something Brandon Weeden had absolutely no interest in doing, but he’s not Tony Romo. I’ll lay the points with a hobbled Dez going against a rejuvenated and desperate Legion of Boom, and I expect Russell Wilson to make Greg Hardy look silly on the other side of the ball. If only the Broncos had a quarterback right? Their defense has been spectacular. They deserve all the credit they’ve gotten for this 6-0 start. But they did give up big plays to the Browns two weeks ago, I think Aaron Rodgers can make a few more. Hopefully Cobb and Adams got healthy over the bye week, and to be perfectly blunt, Peyton usually spots teams seven points at some point in the game. Also, don’t bet against Aaron Rodgers in night games. I am 100% banking on the signature Andrew Luck backdoor cover in this one. The Panthers deserve to be undefeated in the sense that they’re better than all of the teams they’ve played so far, but the offense struggles to make plays despite the tremendous play of Cam Newton. His receivers were at least partially responsible for all three of his interceptions last week. But defensively Thomas Davis and Luke Kuechly are the best linebacker duo in the league right now. Hopefully Luck is healthy enough to do something about it. For college football fans or just degenerate gamblers who will bet on anything, I’m in a weekly college football pick ’em. Here’s my picks for this week: Washington State (+11), Notre Dame (-10), Florida State (-20.5), New Mexico State (+5.5), Tulane (+32), Florida, Colorado State, and FI(Not A)U straight up. C’mon fans of the Steelers, Jets, Colts, Ravens (and on and on and on), admit it, you have to respect what this man has done. I know you may not be willing to admit anything publicly. Deep inside you still think he had to be cheating to do what he has, otherwise you’d have to admit your team actually lost to a “human” and you don’t want to do that. Among your fellow fans, when you belly up to the bar, you still mock him and talk about deflated footballs. But when you take a moment and are honest with yourself you would love to have Tom Brady QB your team. You know it…I know it…and, don’t feel bad, your team feels the same way. 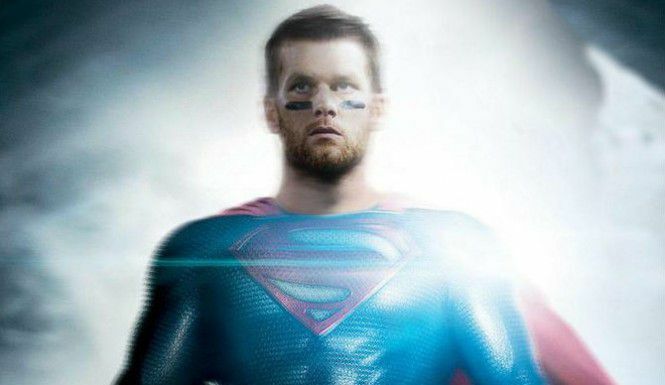 Is Tom Brady better now than he has ever been? With a mobility in the pocket that he has never shown before he looks like a “new” Tom Brady. Don’t get me wrong, he has always been great, but this year he has moved into a new stratosphere. It’s not hyperbole, it is a fact and the eye test backs it up. Game-by-game he meets and exceeds expectations. Please don’t tell me he doesn’t have the weapons that other great QBs have. It doesn’t take anything away from what Mr. Brady has done this year to acknowledge the greatness of Rob Gronkowski (or Randy Moss in 2007). Julian Edelman and the now healthy Danny Amendola aren’t anything to laugh at, and Dion Lewis has emerged as a top tier running back/receiver. However, with that said, Brady makes everyone on the offense look better. The ensemble that makes up the offensive line attests to what he is capable of doing. If you can name the starting five linemen for last night’s match-up with the amazing pass rush of the rejuvenated Miami Dolphins without looking it up, congratulations. Credit the quick release (fastest in the NFL) of Tom Brady with the fact we’re not in panic as each weeks latest super team lines up on the other side of the ball. Speaking of which, I don’t know about you, but I’m tired of hearing how all these teams are suddenly able to “challenge” the Patriots dominance in the NFL. Before they can challenge they have to show they can beat the best…and so far no one has done that. Here is where I would brag about getting two straight Thursday night games right, but considering I only got three games right last week I think I’ll hold off on any bragging of any kind. Here’s the main takeaway from last night’s game however. The Seahawks will struggle to make the playoffs. They didn’t play that great, and they have major flaws offensively. Their offensive line is inconsistent, they can’t run the ball against good teams, and their weak receiving core is highlighted when they have to make plays. This is a classic case of a young team, with everyone trying to make it, coming together with a driving force to prove themselves, and they were very successful the last three years. Now that’s worn off, they’ve gotten paid, and the hunger is gone. Right now they have seven guys, Russell Wilson, Marshawn Lynch, Jimmy Graham, Richard Sherman, Kam Chancellor, Earl Thomas, and Bobby Wagner taking up approximately 762% of their salary cap (again, that’s an approximate number). So what’s occurred as a result? They have no depth. And believe me, it’s only going to get worse. Their going to have to let some of these guys go in the near future, and Pete Carroll might start thinking that the Legion of Boom isn’t as formidable as it once was, and that USC job is there for him again and he avoided all of the penalties. On to this week’s picks, which can’t possibly be worse than last week. Leave it to Rex Ryan to ruin a potential Super Bowl contender. The Bills are littered with talent, and it looked like they found a quarterback that could get them somewhere. Rex sprinkles his magic, they think they’re going to win the Super Bowl after three games, they scuffle a little bit, and now Sammy Watkins, Mario Williams, and Marcel Dareus are all complaining. Way to go Rex. Meanwhile the Jets seem to be doing just fine without you. Also, here’s to hoping for Gus Bradley’s sake he doesn’t get left in London with Joe Philbin. Maybe the FFCA (Fired Football Coaches Association) can open a location out in London if he does. You hear that Jon Gruden? I’m expanding your corporation for you. Your welcome. I stand by everything I said about the Redskins last week. They were banged up and still were going to cover the spread against the Jets, who will be a playoff team this year, until late in that game. This week they’ll be a little healthier and I like them a lot at home against a very shaky Tampa team. I’m not at all worried about this Falcons team. Any Thursday night loss I think can be explained away as being a weird short week where most teams don’t play well. Julio Jones played hurt last Thursday but now he’s had ten days to heal up (and he still had almost 100 yards receiving last week), and this team is stacked with offensive talent. The Titans were dominated last week and it sounds like Mariota won’t play. I love the Falcons in this one. I have to say, I was pretty impressed with the Colts last week. Other than Chuck Pagano stupidly trying to outcoach Belichick, they had a great gameplan for a compromised Andrew Luck and played with some pride. I think their gameplanning with Luck’s shoulder being hurt actually helped them. They ran a lot of three and five step drops with him with timing routes designed for him to get rid of the ball quickly. That’s a lot better than just letting Luck drop back, have everyone go deep, and let that horrible offensive line get run over while Luck tries to buy time and chucks it down the field as he gets clobbered. Maybe they’ll do more of this, and I’m expecting no horrible fake punts in this one. Perhaps the Lions figured out that their best offense is to just have Stafford throw 60 yard bombs to Calvin Johnson every play, but I expect them to lay an egg offensively this week against a decent defense as they’ve done so many times this year. I can’t tell if this Vikings team is good or not, but I know the Lions aren’t, and I’m happy to only give two points to Jim Caldwell in this one. The Steelers have done an excellent job of surviving without Big Ben, and have actually gone 2-1. Now they play a putrid Chiefs team with no running game to speak of, and no deep passing game. Maclin probably won’t play, and the way to beat the Steelers is through the air. Landry Jones looked good in relief of Vick last week, I expect him to be a little better with a full week to prepare. Also, the AFC stinks, and you can pretty much write the Steelers in as a Wild Card team at this point, and if Roethlisberger can play against the Bengals next week, then there’s still a lot to be decided in this division. The Browns are not a very good team, but they are a tough out. They have a good defense, can run the ball a little bit, and have some decent receiving threats in Travis Benjamin and Gary Barnidge. I also like the Rams a lot. They have a lot of deficiencies, but they know what they do well and what they do well they do really well. They run the ball well, Todd Gurley is a beast, and they have a stout defensive line that gives opposing quarterbacks problems. I expect this to be a low scoring game and I’m taking the points. The Dolphins are a different team post-Joe Philbin. As I accurately predicted last week, they are a talented team, capable of being the playoff contender we all thought they’d be before the season, they just need to play like it. Also, the Texans are horrible. I’m not impressed with a 31-20 win over the Jaguars. They are offensively challenged, and one week doesn’t change that. I expect the Dolphins to roll at home. The Patriots are the superior team, but they don’t have a great defense. Their pass rush is good, but the Jets strength is running the ball, and they will try and shorten the game and control the clock. It’ll be interesting to see if the Patriots are able to take away the run, and force Ryan Fitzpatrick to beat them. 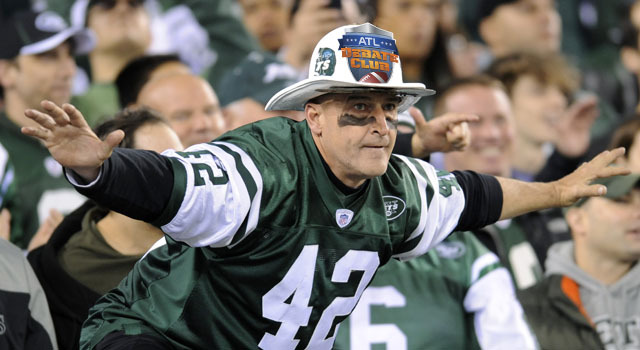 If they can, then it is going to be an ugly day for the Jets. But if the Jets can control the line of scrimmage and do well running the ball, then they’ll keep the game close, and I’m grabbing the points. The Chargers are extremely reliant on Philip Rivers, and now his best weapon, Keenan Allen, is banged up. They have no run game to speak of, and their defense is shaky at best. Oakland is coming off of a bye, and should play a lot better against a Chargers defense that is giving up nearly 27 points per game. I think there might be a little bit of a revenge game factor in this one. The Giants had the Cowboys beat in Dallas until they wet the bed on the one-yard line and gave Tony Romo the ball back. Now the Cowboys are starting Matt Cassel due to Brandon Weeden’s horrible play. We have no idea whether Cassel has any sort of grip on this offense, and he just got cut by Buffalo this year. I like the Giants to bounce back from an awful Monday night game in this one. 1)	New England Patriots – If you don’t think Ernie Adams had something to do with the Colts calling that play, you’re lying to yourself. 2)	Green Bay Packers – The Denim King proved he was human throwing a few interceptions two weeks back, and the defense let up a quarter-mile worth of passing yards. Yet, the Pack is still undefeated. 3)	Cincinnati Bengals – The Bengals have the deepest roster in the NFL. Fact, not opinion. Can the Ginger keep up his stellar play when the elements come into play? 4)	Denver Broncos – Denver’s defense and special teams has outscored the offense. I picked them to win the Super Bowl, but I don’t think they keep this pace up when the weather declines. 5)	Carolina Panthers – Cam Newton did something he hasn’t done since he came into the league. He earned my kudos. 6)	Arizona Cardinals – The Cardinals lost to Mike Vick and Landry Jones. Plain and simple. I won’t and can’t buy a Carson Palmer led team. 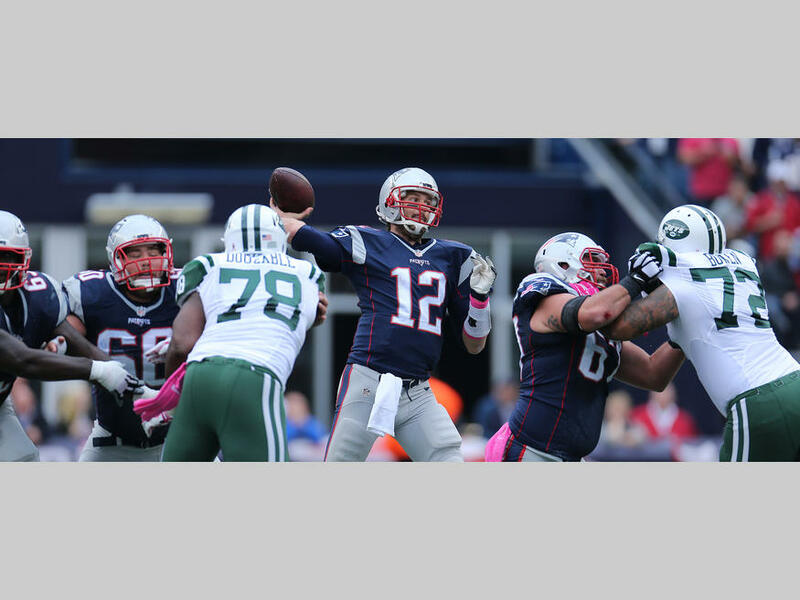 7)	New Jersey Jets – Sheldon Richardson is licking his chops for Sunday’s game in New England. Hey Snacks, so is TB12. 8)	Atlanta Falcons – The Falcons ran into The Kings of Primetime. Not many people beat the Saints in their own building when the stage is at its biggest. 9)	Philadelphia Eagles – When is Chip Kelly going to realize running Demarco Murray laterally out of the pistol is not the best way to use his skillset? 10)	Pittsburgh Steelers – Welcome to the NFL Landry Jones. Big Ben should be 100% healthy before he laces up the cleats again, and the organization will be foolish to allow him to do otherwise. 11)	New Jersey Giants – I’ve never seen a quarterback make more horrible decisions in my life than Eli Manning. I mean these are the dumbest of dumb throws. 12)	Seattle Seahawks – Russell Wilson’s pocket awareness is as sharp as a spork they give to prisoners. 13)	Buffalo Bills – The locker room is already starting to unravel halfway through Rex Ryan’s first season. 14)	San Diego Chargers– If 502 passing yards isn’t winning you football games, something is wrong on the other side of the ball. 15)	Indianapolis Colts– I call it, The Annexation of Puerto Rico. 17)	Minnesota Vikings – The Vikings offensive line needs to improve, regardless of the team winning games. AP is the cog that makes that engine go. 18)	Miami Dolphins – The Fish seemed to play with a little bit of fire for their new coach. Maybe the Oklahoma drill actually works? 19)	Cleveland Browns – Captain Mike must have been sick after that game on Sunday. He had multiple chances to put the Broncos and Manning away, and his team puked on themselves. 22)	Chicago Bears – Alshon Jeffery’s return is going to be huge for the Bears offense. They need more out of the running game from Matt Forte to be competitive though. 23)	New Orleans Saints – Brees delivered per usual for the Kings of Primetime. 24)	Kansas City Chiefs – The Chiefs may not win more than four games this year. The team is a mess in all three phases of the game. 25)	Houston Texans – Deandre Hopkins may be the best receiver in football in only his second year. 26)	Tampa Bay Buccaneers – Bye week. 27)	Washington Redskins – Gruden making excuses for the weather being too windy for his quarterback is not a good look. 28)	Detroit Lions – Fat Face won a game! Fat Face won a game! 29)	Jacksonville Jaguars – Not only do the Jaguars stink, they have to make their annual trip across the pond to get beaten by the Bills on Sunday. 30)	San Francisco 49ers – I’m happy for Tomasula. We all laughed at his EBS issues in his presser a few weeks back. The Niners put their foot on the gas Sunday against the Ravens, finally. Plenty of pun intended. 31)	Baltimore Ravens – Oh Baltimore, you will be 1-6 by this time next week. Life is good. 32)	Tennessee Titans – Mariota has a slight MCL sprain. The Selfie King may be taking the snaps for the next few weeks. After dominating the AFC East division without any competition for four years now, the New England Patriots finally have a legitimate competitor in the New York Jets. Coming into this season, many, including myself, expected the Buffalo Bills to be a serious threat to the Patriots because of Rex Ryan’s defensive mind and the depth they have on the defensive side of the ball. As it turns out, Rex has seemingly lost control after the week two loss to the Patriots, and things are starting to unfold because of his reckless demeanor. The Dolphins simply just spent money carelessly in the offseason, leaving them extremely thin in many parts of their roster. The Jets however, shipped out the rambunctious Rex Ryan and brought in another defensive mind with former Cardinals defensive coordinator Todd Bowles. This time, the head coach is much more soft spoken, but he looks to have a strangle hold on the team and has one thing that Ryan never had in New York, control. Despite their 4-12 record last season, the Jets still had a very talented defensive front that could get after the quarterback. The front seven consists of elite players such as Muhammad Wilkerson, Sheldon Richardson, David Harris, Calvin Pace, and they also added defensive tackle Leonard Williams out of Southern California in the first round of this year’s draft. Many projected him as the best overall player in the draft. The Jets secondary did a complete 180 in the offseason by going from having one of the league’s worst pass defenses to having potentially the best. When you bring back Darrelle Revis who is arguably the best cornerback of all time and without a doubt the best right now, your defense already changes completely for the better. Then you add a big bodied corner with Antonio Cromartie who can match up with tight ends, and Buster Skrine as a nickel back next to Revis, your secondary becomes lock down. On the other side of the ball, the Jets have added fire power as well. They acquired Brandon Marshall from Chicago via trade this offseason to compliment Eric Decker. The combination has been very effective through five games. Marshall already has 37 receptions, for 511 yards, and four touchdowns. In addition, Chris Ivory is a very physical running back who has also gotten off to a great start averaging 5.5 yards per carry. The only glaring issues on the Jets roster is the most important in the game, and that is at quarterback. Ryan Fitzpatrick is one of the most inconsistent quarterbacks we have seen in a long time. He played so well for a few weeks in Buffalo they rewarded him with a contract extension. After that he played so bad they were forced to release him after one year. He has not been terrible this year, however Bills fans will tell you that a collapse is on the horizon. Jets fans are just crossing their fingers that their defense can carry them to the point where Fitzpatrick can’t lose them the game. 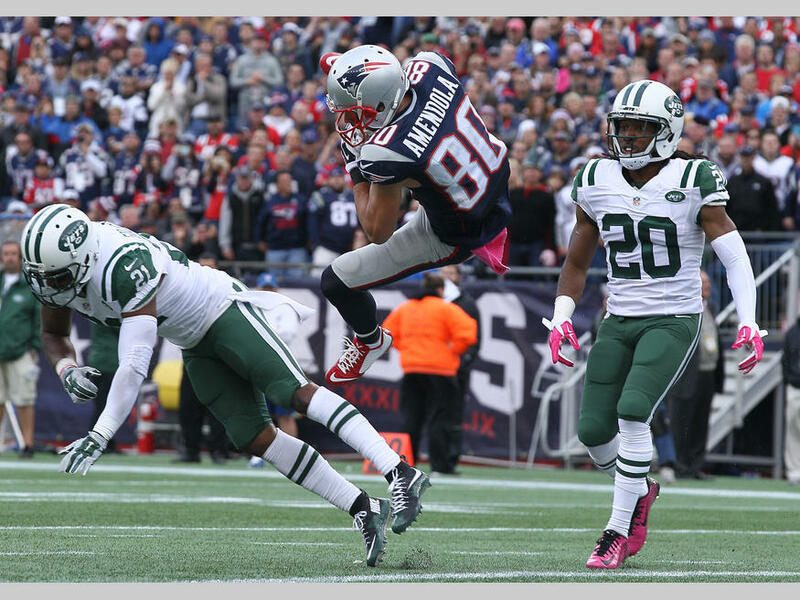 This week, the New England Patriots have to take on the 4-1 New York Jets at the friendly confines of Gillette Stadium. It will without question be their toughest test up to this point, especially if Marcus Cannon and Ryan Wendell are not able to go. As a Patriots fan you should feel very uneasy about rolling out Cameron Fleming at right tackle going up against this Jets front. Not only can the front get to Brady, but Revis and Cromartie can neutralize Julian Edelman and Rob Gronkowski and force Brady to hold onto the football longer. Now, one thing that puts both teams at a disadvantage is that both coaches are unfamiliar with each other. The last time Bowles squared off with the Patriots was in week two of the 2012 season when his Cardinals beat the Patriots 20-18, with the defense sacking Brady four times. I have full confidence that Bill Belichick, Josh McDaniels and the Patriots coaching staff will put together a masterful game plan to move the ball against the Jets defense and hold their offense in tact. Nevertheless, Patriots fans need to know that the Jets are a threat in the division, not the laughing stock that we are used to. That could very well help the Patriots come January as they will be battle tested. 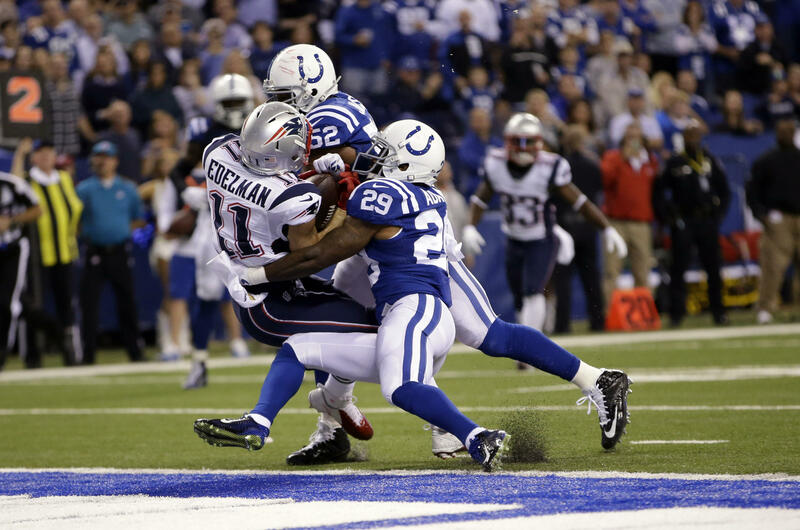 New England Patriots: Halloween Arrives Early In Indy! Let’s be honest, the Sunday night match-up between the New England Patriots and the Indianapolis Colts didn’t go as planned. No, not because the Patriots only won by 7 points, 34-27 (should have been 34-21, but Colts scored a garbage time TD). It wasn’t because LeGarrette Blount “only” ran for 93 yards. It wasn’t even because Julian Edeleman actually dropped three passes, one leading to a pick six by the Colts. It was because…are you ready?…the Colts thought it was already Halloween and decided it was going to be “trick” not “treat” night at Lucas Oil Stadium. relative ease to take a quick 7-0 lead. Things settled down for a while before the witches stepped in and put a hex on Edelman, causing him to injure his finger and start dropping passes. The most damaging drop occurring in the 2nd quarter, when a Tom Brady pass bounced off #11’s hands into the waiting arms of Mike Adams, who scampered 14 yards down the sidelines to give the Colts a 14-10 lead. The pass was Brady’s 1st interception of the year, but the blame fell squarely on those damned witches as they made the perfect pass bounce off the usually sure hands of the hexed Edelman. At this point the Goblins entered the head of Indy Head Chuck Pagano. As visions of sugar plums danced in his head, oh wait a minute…back-up, that’s Christmas. Thinking this was time to spring surprise #1 of the game, the infamous on-side kick, Pagano and his special teams coach went for it. Pagano was in shock. My God, how could that be, he thought, as his head spun (kinda like in the movie The Exorcist). Knowing exactly what to do, he grabbed the red flag from his sock and hurled it on the field to challenge the play. “Upon further review their was no clear view of the fumble recovery, therefore the initial call stands” blared through the PA system. Six plays later Blount rumbled 38 yards “giving” the Patriots back the lead, 17-14. The Colts scored another TD and the Patriots a last second field goal as the hectic half ended 21-20 and everyone took a deep breath…and believe me, they would need it. Possibly The Worst Play In NFL History? You have to give Pagano credit, per Ian O’Connor, ESPN Senior Writer, after the game he said “I take full responsibility for that,” as if he had any other choice. As far as the Patriots being unprepared for either that play, or the earlier onside kick, here is Coach Belichick’s post-game response “We expected this to be a gadget game in the kicking game,” The man has his team prepared for almost everything, yet other coaches continue to try to trick plays that look foolish. 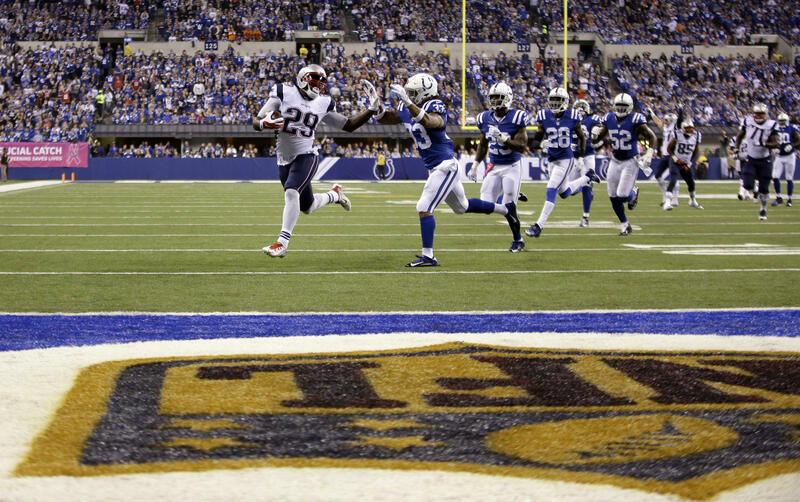 Right about now Colts fans are spouting the line “it was a moral victory”…or “we gave them the game”. No matter what, one thing is obvious…the Baltimore, oops, Indianapolis Colts were running scared even though they held the lead at halftime 21-20. Play calling was in respect for what the Patriots could do and in fear of what the night would bring.